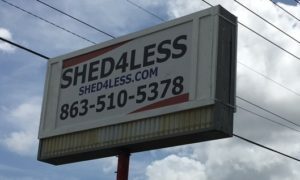 Sheds 4 Less now has 3 locations to better serve Polk County! Larry Wood is a local contractor who provides full service for all his customers. Larry carries a large display of Superior Sheds on all his lots as well as a complete line of Carports and Steel Buildings. Check out a lot near you – View sheds of various sizes, colors, and styles. If he doesn’t have it on the lot he will have one made to your specifications! Larry prides himself on being a “Polk County Guy” as well as have the best products at the lowest prices. He can also help with the permitting process or any other needs you may have. Larry and his crew of associates view their customers as neighbors. Two convenient locations in Lakeland! Shed Sales and Delivery/Shed Moving Servicing Lakeland, Auburndale, Winter Haven Mulberry, Bartow, Lake Alfred, Plant City, and surrounding areas.